Like our snake bags, these are among the toughest and longest-lasting bags we carry. Constructed of highly UV-resistant polyethylene monofilament, they'll last for years and stand up to tough abuse. They come with sturdy tie strings and have welded edges. 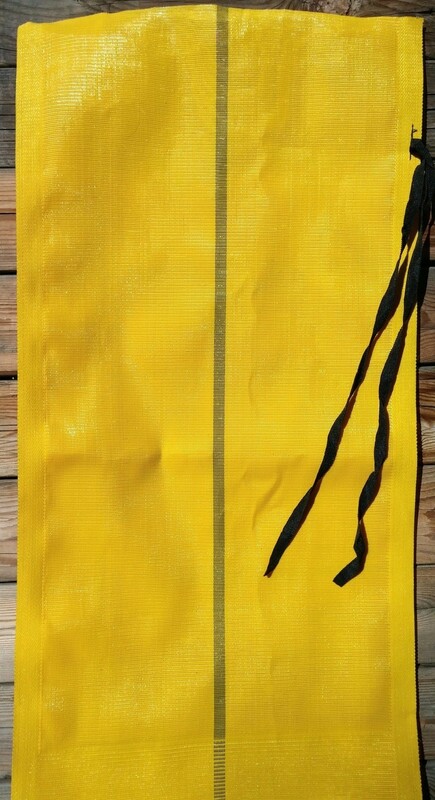 Bright yellow color reduces trip hazard. Capacity is 30 to 50 lbs. Because they're slightly open weave, these are ideal for filtering out sediment while allowing water to pass through. Gravel fill is ideal for filtration and for ballast. Fine fill like sand or silty dirt might sift out or wash out over time. You can empty them out and re-use them; just hose them clean, let them dry & store them. Uses include BMP for stormwater management, erosion & flood control, and ballast for machinery, highway signage, tarps, and vehicle traction.